I should be eligible for an interview by the end of next month, and I have no doubt I'll have made all the purchases by then- I've been purchasing obsessively since I stumbled into the forum! Lol! Thank you for guiding me in the right direction, I've appreciated your help so much! You've inspired me to push through and make it happen, and I will always be grateful. Please note that your interview with miss cat will be scheduled only after you complete your purchase requirements. It's a straightforward process and you are doing everything right. Yes, learning directly from miss cat is a very valuable opportunity that you won't want to miss. I predict you'll do very well on the course and I'm looking forward to hearing about your progress. Finally completed my first attendance at an apprenticeship week! It was a LOT of intense learning and hard work! When the Tuesday numbers were added up and we had created over *1000* bottles of oil it was unbelievable. The format of alternating days of history/lecture and hands-on work creating products for the store is a good one. And happily we are able to keep one oil, one incense and one mojo of those we create, so I am very proud of the Black Cat oil, the House Blessing incense and Steady Work mojo kits I worked on, as well as the others I did. It makes me smile to look over at thee products and remember the intense experience of this last week. I highly, highly recommend these apprenticeship weekends to every graduate of HRCC. It is not easy, it's a of note taking and hard work, but seeing Miss Cat's incredible collections of oils/salves, incenses and mojo pieces was an incredible treat. Miss Cat must be exhausted at the end of this week, and I thank her so very much for giving of her time to those of us who can attend. There were 11 of us including some employees at this training week. WOW! Thank you for posting about your experience. It sounds like it was a fantastic week and time well spent. I'm delighted to have just booked airfare to sunny California to attend the 2018 apprenticeship week! For those of you that flew to California for your apprenticeship training, did you rent a car or bike to get to and from the shop and your lodging? I looked at Lyft and Uber and they appear to be active in Forestville. Have folks had success with rideshare services like Lyft and Uber while apprenticing? Thanks for the insight! 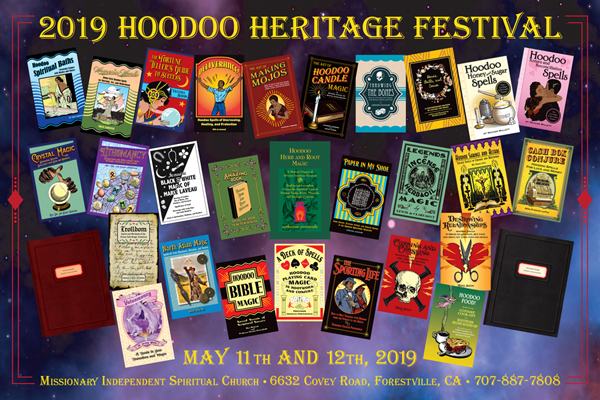 I think I'll be able to get a place relatively close to the shop - but just need to figure out transit from SFO to Forestville and from my lodging to Santa Anna for the Hoodoo Heritage Festival (probably Lyft or Uber if I hear from y'all that it's reliable). Thanks in advance for any insight y'all can provide. A buffet-style lunch for all Apprentices and Lucky Mojo Staff; food and drinks are catered by the entire Lucky Mojo Staff. A sit-down dinner is catered on Wednesday night by Heidi Simpson, the Lucky Mojo Shop Manager. The Apprenticeship Curriculum is tight and intensive. It runs from 9:00 AM to 5:00 PM, during shop hours, with 1/2 hour allowed for lunch each day except Monday, which has a 45 minute lunch break called the Apprenticeship Lunch, an obligatory event at which Apprentices meet and mingle with Lucky Mojo staff. There is also an obligatory Apprenticeship Dinner during the week, catered by Heidi Simpson. Due to the tight teaching and training schedule, we ask Apprentices to not shop the store while apprenticing or after hours. You are welcome to shop during your lunch break, or to submit a shopping list when you arrive and your goods will be ready to be rung up during one of your lunch breaks or, if the order is a large one, it will be ready for you to check out on the Saturday morning following your Apprenticeship week. Please call ahead and let Leslie Lowell or Heidi know you will be attending so that we will have enough supplies on hand to train you! I hope you are in good spirits. I’m interested in the Apprenticeship week. Who do I need to contact to see if I can get into the class? Thank you. Have a wonderful day! Hi, Solaris -- i hope you got the information you needed. My role in the Apprenticeship is to SHOW UP AND TEACH. Organizing it is the job of Leslie, Heidi, Yose, and others. We are NINE DAYS away from the April 2018 Apprenticeship program, and there are still a few places left. If you are a graduate and want to attend, please contact Leslie Lowell or Heidi Simpson at the shop NOW. 707-887-1521. Thanks! Hey all! We are trying to get up a Week 3 apprenticeship training scheduled the week of October 8-12, which is the week before the fall Mystic Fair in Santa Rosa. We have four people confirmed so far with one checking on ability to get time off. We need six minimum, and 9-15 would be better. Please indicate whether you would be interested so we can formally propose this. A few of us are one-away from graduating! Thanks! From 2003 through 2018, out of 2,100 enrolled Hoodoo Rootwork Correspondence Course students, about 570 have turned in their homework and graduated -- and are eligible for free Apprenticeship training. From 2005 through 2018, about 80 graduates have gone on to complete the three-week hands-on Apprenticeship Program. If you are a course graduate and intend to attend, please contact Leslie Lowell at the shop -- 707-887-1521. As always, the Apprenticeship teaching is a free work-trade arrangement -- 20 hours of teaching for 20 hours of supervised work and training in the history, practical use, and manufacture of spiritual supplies for the home practitioner or aspiring professional root doctor or shop keeper. I am about to embark on five days of teaching my graduate students how to make bath crystals, sachet powders and jack balls. There will be eight folks in attendance. For some of them, this will be their third of their week-long sessions and they will graduate from the apprenticeship, fully informed on the history of hoodoo and conjure "order houses" and able to become makers of spiritual supplies for their own clients or their own shops. As always, this program is FREE, and is run as a work-trade agreement, with 20 hours of teaching and 20 hours of "making" (plus two free meals) in the bargain. My friend (and grad student) Alyse GoRay arrived last night and we went to dinner at a lovely new Indian restaurant in Sebastopol, and i ordered the delicious and cross-culturally festive Artichoke Pakora! What a treat! We look forward to greeting Heidi Holton, Joshua Saunders, Domenica Mazepa, Scarlet Moon, Muttaqi Al-Mustafa, Mary Thomson, and Althea Anderson, plus, as a special guest, Angela Horner. Angela went through this program years ago and has her own spiritual practice now and is a member of the Association of Independent Readers and Rootworkers, but she has opted to sit in with her daughter and help me as a "runner" during the production phase of the teaching. Meanwhile, 60 lbs. of Bat Nuts from China are drying in my kitchen and in the Lucky Mojo Curio Co. shop and the weather promises to be sunny all week. Okay, i am off to my job as a teacher! Love to all of you! It was a great success, a great potluck, got the video made of the array of products. Bathing beauty! I am so thrilled to see “Grad-Apprentice” by my name. It was a delight to finish and graduate from our apprentice training with three other people who started when I did — Heidi, Domenica, and Alyse. Week 3 was very intense and a bit messy on sachet powder day, but on both bath crystal and powder days there were such good smells and it was wonderful helping to mix, bag, and pray over these products. Friday was creating a jack ball, which was very interesting. I wanted to especially touch upon the wonderful conversation, not just the learning from Miss Cat, but the atmosphere of free, intelligent, and studious conversation. In a global time of distorted rhetoric, it was a week of being able to have real, down-to-earth conversations, to discuss sensitive historical topics in a truly educational atmosphere, and really bring together the multiple cultural aspects that boil down to hoodoo. I have at all three weeks learned something that was not in a book or found elsewhere, and my notebook will always be one of my references. If you are a graduate and you are considering taking apprenticeship weeks, you will work very hard, but the learning opportunity is not to be missed. You will network with other course graduates who are in varying stages of completion of apprenticeship — everyone learns from everyone else’s experiences as well as Miss Cat’s incredible knowledge. Thank you again, Miss Cat, for giving another week of your abundant knowledge and sharing your ephemera and artifacts with us. I had a great time teaching and working with you all this week, too, Mary. Thanks for posting. Five of my course graduates completed apprenticeship training at this session -- Alyse, Domencia, Heidi, Mary, and Ray. And a wave to the other three apprentices, Althea, Ro, and Joshua, who still have more classes to complete before gaining their certificates of training. I have a question about non-Springtime training that I can't seem to find. And I'm fully prepared to be told "well, it depends"! How commonplace is it to get enough people together to schedule an 'extra' training course during the year? I ask because I am not a US resident and flights to the States are really expensive anymore. I would love, love, love to attend the apprenticeship training...but late spring no longer seems to be a part of the "off season" for travel ticket pricing. The "extra" apprenticeships are organized by the apprentices themselves. I have told them that if they can put together a group, set a date, and take care of that end themselves, i will teach the course and my shop will hire assistants ("runners") to facilitate the program. and scroll down a bit, you will see exactly how many non-spring apprenticeships i have held over the years. I ask because you are posting this question in the Lucky Mojo PUBLIC Forum as a newly registered forum member, and this is a question that would normally be asked and answered in the PRIVATE student forum. If you are a student and never logged into your student account, please contact nagasiva yronwode on Facebook and he will set you up. In conjunction with the 12th Annual Hoodoo Heritage Festival, May 11th and 12th, 2019, i will be teaching a FREE Week Two Apprenticeship Program from May 6th through May 10th (Monday through Friday) for course graduates only. Better turn in your homework if you want to attend! As always, tuition for this hands-on training is free and you get two free meals -- a potluck lunch and a sit-down dinner (and you are expected to attend both). All materials are provided. You must arrange your own transportation, room and board. The hours of attendance of 9:00 AM to 5:00 PM every day, with a half-hour break for lunch. I plan on attending the apprenticeship in May. I see that there aren’t more scheduled. If more are scheduled, I would like to participate. I look forward to your being here! Please contact Leslie and let her know so she can send you more detailed information and get you counted in the system. She is leslie@luckymojo.com -- and using the subject line MAY 2019 APPRENTICESHIP wll help her catch your email. See posts above for more on these "extra" apprenticeship sessions. I have promised that i will teach any gathering of a dozen students, but i don't have time to teach fewer than a dozen for free. Some years the students have pioneered two or more extra training weeks for the year and some years they have not. In any case, i am here and willing to teach! I would like to sign up for the correspondence course. I’m in the process of completing my required purchases. However, I did purchase all of the required books. Could I begin the class while I am still making the purchases? I am very interested in completing this course. I have been planning this since last year. And I would love to be one of Miss Cat’s students. Please advised. When will the next class group begin? Hello. Glad to hear that you are considering the correspondence course. Unfortunately, however, all purchases must be made prior to enrollment so you'll have to complete those and have an interview with Miss cat, but it seems like you're doing great. You'll be eligible in no time. The classes are ongoing and completely individual. There are no groups in other words. You complete it at your own pace. If you're referring to the apprenticeship program however, that is reserved only for graduates and takes place every year in May. It is a three week program and every year is a different week of the program so for instance, if you were just graduating the correspondence course this month, you would be eligible to take the apprenticeship class this may and it may be week two so the following year you'd get week 3 and finally in 2021 week 1.